Travelling overseas over your uni break? Have you booked in for your immunisations? Registered nurse Jo-Ann Hoban based at the UQ Health Care Gatton Clinic shares what you need to know about travel vaccines. If you travel outside Australia, you may get sick from a number of diseases that are preventable by vaccination. Different vaccines are needed for certain countries. There is no standard immunisation schedule that will suit all travellers. The recommended vaccines for travelling depend on a number of factors. These include your age, pregnancy or planning pregnancy, underlying medical conditions, vaccination history, location and season of travel. You should book an appointment at a UQ Health Care Clinic six to 12 weeks before you leave Australia. It is important that you don’t wait until the last minute to visit your doctor to discuss what vaccines you need for your trip. You might need a number of doses of a particular vaccine and you might need time after immunisation for your body to develop full immunity. Even if you have been vaccinated for certain diseases in the past, you should still check with your doctor or travel health clinic. Your immunity to some diseases may have changed or reduced with time and you may need a booster. Also, depending on your age and where you were born, you may not be protected against some diseases. Travel is an important time to check whether you are up to date with your vaccinations. These can be routine childhood vaccinations and boosters. Some of these include measles-mumps-rubella (MMR), diphtheria-tetanus-whooping cough (pertussis), polio, chickenpox (varicella) and influenza. The chance of getting these diseases may be greater while travelling overseas. These diseases can be brought into Australia by travellers and lead to disease outbreaks. Travel vaccines that may be required include hepatitis, typhoid, meningococcal, rabies, Japanese encephalitis, yellow fever* and cholera. Find out more or book an appointment at a UQ Health Care Clinic. 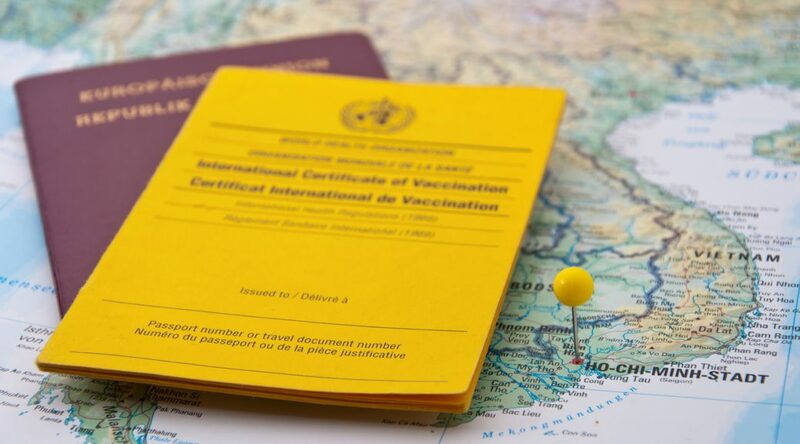 Remember to bring in a copy of all your previous vaccines if possible, both childhood and travel related and an itinerary, so the correct vaccines can be determined. *Please note the yellow fever vaccine is only available at the St Lucia and Annerley clinics.